With lots of grey matters ranging from internal power squabbles, unrealistic growth on the market, underground team of a workforce, since its launch on September 17th, Tezos (XTZ) has never departed on the lips of cryptocurrency community. The project also has controversial lawsuits hanging over it as it continues making headlines worldwide. The team of programmers behind the coin Tezos (XTZ) had a clear vision when coding but failed to implement successfully upon completion. Till date, they have a daunting task of making this ICO cryptocurrency the best performer on the market and also make it stand against other cryptocurrencies. It is the duty of this beginner guide to detail the key factors surrounding this Blockchain. Tezos is a cryptocurrency, Blockchain based platform running on smart contracts technology just like Ethereum. Tezos is said to have been developed in the USA by Ex-Morgan Stanley specialist, Arthur Breitma and is aimed at provides significant self-improvement features and community grants. It stands in the Ethereum category hosting dApps and smart contracts under a native token Tezzie (XTZ). The robust, secure and future-proof smart contract system platform uses community input to improve upon its flaws and create a fast and efficient protocol. With its robust blockchain and decentralization application, Tezos issued its own coin XTZ (pronounced ‘tez‘). For now, its main purpose is to serve both as an investment and a decentralized application platform. Tezos (XTZ) is also designed to handle transactions, as payment for code evolvement and platform improvements. In the year 2018, it reached a significant milestone ranking among the top 20 according to market capitalization. Arthur Breitman a computer engineer and mathematician with a background in working the financial industry. He resigned from his formal employment and devoted time to come up with Tezos (XTZ). He closely followed the historic rise and adoption of Bitcoin from the outset and noted it’s “inability to evolve” and instead lead to him developing an “upgraded version”. His proposed solution gave birth to the Tezos project that exists today. Kathleen Breitman with vast experience working in the financial sector for big renowned companies such as Bridgewater Associates and R3, she brought her knowledge of arithmetic algorithms. Combined with her husband she played a great role coming up with the ICO which gave her insights into distributed database technology. The first squabbles between the founders of Tezos – Arthur and Kathleen Breitman – and the head of Tezos Foundation – Johann Gevers emerged a few months after ICO. The management fights grew to the extent that the head of the custodial Tezos Foundation had to leave. By that moment, investors of Tezos (who are donors actually, according to Tezos’ documents) already had been waiting to trade their tokens for several months. The dispute between founders and Gevers led to the community mayhems, which led to the estimated exchange rate reducing significantly after the unveiling of Breitman’s’ petition. The published letter contained uncomplimentary characteristics of Gevers, including words like “self-dealing, self-promotion and conflicts of interest”. According to CoinMarketCap, there is a total supply of roughly 763 million “Tezzies” in the currency pool. The coin is designed to adjust to an annual inflationary model of 5.5% on a yearly basis. Therefore, every year, the coin is expected to grow by 5.5%. Also, the Tezos foundation aims at having the blockchain create new blocks every 60 seconds though it has been averaging around 64 seconds for some time now. Ethereum is one of the cryptocurrencies closest to Tezos in terms of similarities. Ethereum is currently the second cryptocurrency in terms of market capitalization and just like Tezos, it has a smart contract feature. How is Tezos different from Ethereum? Below, we will outline a few ways the two blockchains function. With Ethereum, changes made on the blockchain are for the most part done by the Ethereum foundation and its developers. They operate on a set road map and other stakeholders have limited influence to change or influence its implementation. However, with upgrades and changes within the Tezos blockchain, on-chain governance system is being used. This means developers can submit suggestions for change to the Tezos network which is then being voted. If the required votes are gotten, then the change will be implemented and the developers then receive an incentive. 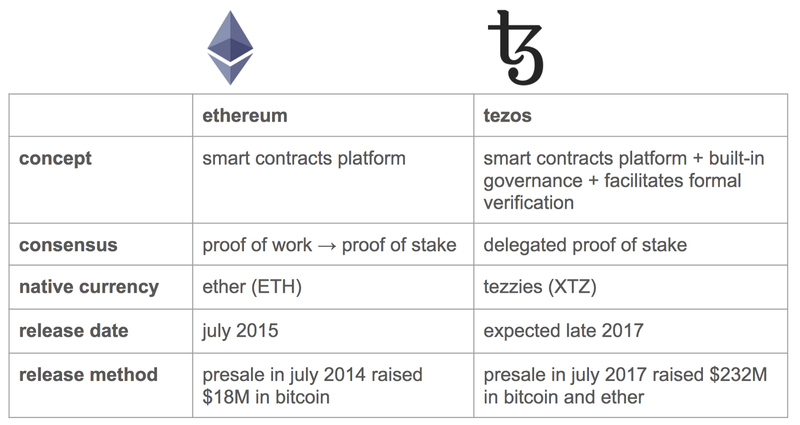 While Ethereum was founded under a Proof-of-work consensus mechanism and will soon be switching to proof-of-stake, Tezos operates under a operates under a delegated proof-of-stake mechanism. The proof-of-work mechanism used by Ethereum requires high energy usage and requires miners to proof that they have extended the necessary resources in computing a harsh lower by a certain target. On the other hand, the delegated proof-of-stake mechanism by Tezos allows token holders to delegate others to come to an agreement on the state of the network for them. Where to buy and Store XTZ? Tezzies have yet to be listed on some major exchanges as most major exchanges do not yet support the coin. This will most likely lead to the project gaining wider adoption. Gate.io is a relatively new cryptocurrency exchange launched in 2017. The coin aims at offering a hassle free exchange for the buying and selling of cyrptocurrencies. If you are planning to use Gate.io to buy your Tezos, bear in mind that the exchange doesn’t provide a fiat purchase option. You can only use cryptocurrencies like Bitcoin to buy Tezos on the exchange. Huobi is another exchange where you can buy Tezos from. The Singapore based exchange is one of the popular cryptocurrency in the world as it is the 3rd largest cryptocurrency exchange in terms of trading volume. If you would love to buy Tezos via Huobi, it is important to note that the exchange does not support fiat deposits or bank transfers so first time cryptocurrency investors will have to first buy Bitcoin from exchanges such as Coinbase then send to their Huobi Bitcoin wallet where it will be swapped for Tezos. Bitpanda GmbH is a fintech company in Austria. The company serves as a broker that buys and sells cryptocurrencies. Like many other cryptocurrencies, there no official wallet. However, according to some social media posts, Tezzies can be stored on a wallet via the command line which is said to suit mainly programmers. TezBox provides a user-friendly web wallet which can be accessed from your browser. This is a community-driven wallet but we do have to stress that web wallets are a serious security threat and storing and retrieving your coins this way is completely at the user’s risk. Obsidian systems recently announced a wallet application for the Ledger Nano S which comes as a welcome development for secure storage moving forward. With unstable start, Tezos has now launched their ICO and offers some promising innovations, especially in governance. Governance of blockchain networks is among one of the most arduous tasks to take on as it is a completely novel field that consists of creating sustainable and fair governance mechanisms for vast networks of decentralized users. Today, many blockchains claim to be the great solution to the problems facing the earlier networks like Bitcoin and Ethereum, and while they may provide some unique innovations out of the box, there verifiable sustainability, security, and practical application have yet to be fully realized. Perhaps with a governance mechanism designed to allow the platform to autonomously evolve, Tezos can provide a new model for on-chain governance of scalable, decentralized networks.